Simply fill up the form with your full name, ID number, email/phone and leave the campaign a message! You can walk about to canvas for signatures with the above petition, download a copy, fill it in and return it to PO Box 276, Bras Basah Post Office, S(911810) or email it to sosbukitbrown@gmail.com. Alternatively, you can simply email us your full name, ID number, and phone or email contact. Click on the following links to download a copy of the petition in English or Mandarin: Bukit Brown Petition (English) | Bukit Brown Petition (Mandarin). Keep our heritage alive, pls reconsider the development. Do we need more construct of Chinatown, Little India, Geylang Serai, Orchard Road to showcase to the tourist our CMI culture and the ‘vibrancy’ of Singapore? We certainly need to do our part to save Bukit Brown. The reasons given by the government are not adequately justified and there is simply a lack of deeper understanding from the stakeholders. Once bulldozed, this change WILL NEVER be reversible. Let’s do our part to save Bukit Brown. Save Singapore and YOUR history/culture/heritage. Thanks everyone for your supportive comments! Please sign the petition if you haven’t already done so. And please pass the words around. Thanks! it is important to keep a piece of our heritage. for the sake of history and the sake of conserving nature. we need grassland not concrete and we need fresh air not flood and pollution. I will sign, but ONLY after the organiser of this petition can tell us how many HDB flats this piece of ground represents, and how many Singaporeans would not be allowed to live here if we kept it as a cemetery. Otherwise, anyone who is signing this petition is doing so BLINDLY. Bryan, you are asking an important and relevant question. This is, in fact, a question that should be directed at the relevant authorities. They can be clearer with that information. In fact, the authorities can also help make clear the degree to which their plans include private housing in addition to public housing. Bryan, thanks for your comment. According to the ST article (http://www.straitstimes.com/BreakingNews/Singapore/Story/STIStory_736000.html), the plan is to build a “future estate that spans more than 200ha – bigger than Serangoon and slated to have a mix of private and public housing. Although this will be developed only in 30 to 40 years, the new road is necessary today to bring relief to the increasingly congested Lornie Road.” According to streetdirectory.com, Serangoon has an estimated 114,000 residents. However, Bukit Brown is right next to a golf course. In fact, if we consider all the golf courses in Sg combined, I wonder if the housing issue can also be solved in developing these other areas that are nothing close to rich historical & cultural value of Bukit Brown. To Toh Zheng Han above. Who said that we will be building Chinatowns, Little Indias and Geyland Serais in this plot of land – the petition organiser? And what is wrong with our Chinatown, Little India and Geyland Serai. Your forefather probably lived in one of these once. Hi Bryan, I’m Erika and I’m one of the petition organisers. The views expressed here are my own. It doesn’t mean that by preserving Bukit Brown, we will be depriving Singaporeans of homes. There are many parcels of land that can be used for housing, but which will instead be used to build new roads, shopping malls, entertainment centres etc. Such developments could be said to deprive Singaporeans of homes too, but there is generally little objection to their construction. As Singaporeans, we have to decide what’s really important to us. Some people, including me, believe that Bukit Brown should rank pretty high on that list of priorities. I strongly for preserving Bukit Brown. It is a serene and peaceful sanctuary where our forefathers can rest in peace and for us to go to, to remember them. I love the untouched greenery surrounding this sanctuary. I am sure many will agree that there are not many of such santuaries still around in Singapore which serves as homes for our forefathers, animals / creatures and greenery. There are other parcels of land in SG which can be used for housing. It is also very rude and disrespectful to build homes on top of the resting areas of our forefathers. Come on, dont we pride ourselves and also encourage ourselves to constantly think out of the box for solutions and ideas? Can we think of another idea other than bulldozing through a graveyard and green sanctuary? Truly agree. My grandpa is resting there. Last year we renovated his tomb. Signed. Not much land to save in Singapore. My great great grand parents are in bukit brown. I think the govt shud not touch it. Let the dead RIP. Why is it that there is never any intelligent debate as to why a land scarce country like Singapore has as many as 22 golf courses and there is never any discussion on eliminating at least half of these for road and housing projects. A typical golf course occupies 60 hectares of land and is used by a tiny sub, and sub percentage of the population. As for the rest, a good number are only slated as being for interim use. Marina Bay Golf Course, for instance, is slated for Residential development if you look at the 2001 Concept Plan. There’s also the spillover economic benefits of Golf Courses that you have perhaps neglected to talk about. Those rich overseas tycoons who come to Singapore to play golf and discuss business, how many end up investing in Singapore? How many jobs did their investments create? Personally, I’m not a supporter of Golf Courses. Could the land be put to better use? Could Singapore do as well with fewer Golf Courses? Perhaps, but its not for us, with our limited research and thought, to dictate. Let the dead have their eternal rest there. For God’s sake, stop trying to destroy our heritage, our roots. Please save this historical place!!!!!!!! Pingback: SOS Bukit Brown on Bukit Brown : a.t.Bukit Brown. Heritage. Habitat. History. Save our culture & our roots..
Pingback: Petition to Save Bukit Brown : a.t.Bukit Brown. Heritage. Habitat. History. 咖啡山的历史是不可磨灭, 历史无价, 先贤对国家的贡献, 就像父母养育孩子一样伟大, 要饮水思源,没有先贤的贡献, 就没有今日新加坡, 请让古老的坟山留下!!! 新加坡人民, 请也为陪伴着新加坡开埠到建国过程的先贤们请命, 让新加坡人民有国家的历史而感到骄傲, 在城市化的当儿为环境保留尽一份力, 同时让这年轻建设的国家在国际舞台上因为有着这一段的历史古迹添加一点色彩而骄傲!!! Save Bukit Brown! Save our heritage! Bukit Brown was one of the first places I visited when I arrived in Singapore three years ago. I was delighted by the seclusion and anonymity of the place, and have made regular visits back there ever since to seek peace and quiet. A serious case must now be made for its preservation. It is extraordinarily unique as a corpus of Nanyang social history – there is simply no other cemetery like it in South East Asia, nestled as it is within beautiful countryside. It includes architectural and stylistic rarities not found on the tombstones in mainland China, and references stories and craftsmanship now lost except amongst the graveyards of the Chinese diaspora, of which Bukit Brown is the exemplar. There is a small but dedicated band of people interested in understanding and preserving the stories that each tombstone tells (e.g. http://bukitbrown.org/). These stories are the social history of Singapore, and should be documented and preserved in an effort to prevent this young country from divorcing itself from the past. There is no better way to preserve history than to secure it within its material context. This rational is readily applied to buildings and documents, and, to the Government’s great credit, has been largely acknowledged in the drive to prosperity since independence, to which the myriad colonial buildings and the superlative national museum pay testament. Other South East Asian nations have not made the same effort in this regard. This same rational must be applied to the social history of the migrant peoples who make Singapore what it is. Therefore, the preservation of Bukit Brown will be an excellent opportunity to secure the history of Nanyang in the minds of future generations. Wonderful opportunities abound if it were to be undertaken properly. The cemetery and surrounding hinterland could be ring-fenced as beautiful nature reserves, to form striking adjuncts to the Botanic Gardens and MacRitchie reservoir nearby. A visitors centre could be established near the future MRT station as a go-to place for anyone interested in finding out more about the pioneers of Singapore. With the appropriate publicity, the natural beauty of Bukit Brown would be a major attraction for people, in the same vein as Bukit Timah hill. Bukit Brown and the immediate hinterland should be preserved as a national monument. I urge the authorities to pause for deep reflection before they proceed with the construction of the proposed highway, to consider what will be lost, and also to consider the wonderful opportunities that this unique place affords in securing the social and natural history of this young nation for the benefit of future generations. The living have a duty to speak for the dead who have no voice. Bukit Brown is hallowed ground, the final resting place of men and women who, as coolies or towkays, and with their blood, sweat, and tears helped build the foundations of modern Singapore. Let us treasure and protect their legacy till such time when all surrounding golf courses and empty state land have been fully built up. By then these departed souls would more likely forgive the living who want to take away their place of rest. I fully support this! A suggestion, why don’t you do an online petition , such as this – http://www.ipetitions.com/ It’ll make it so much easier for people who are not IT-savvy to help you. The landscape of this nation is changing too fast. Just a few years of child rearing and I emerged not recognising many places. Now I fear going to Orchard or Toa Payoh. They’re just changing too fast. How about those who have left our country for study or work? How can the heart string be maintained if more and more traces of familiarities are wiped off? How are we going to tell our children and grandchildren of our past. To engage their interest in our stories, we have to be able to show them where our traces are. Visual evidence is worth more than a thousand words. How can we forge identity & attachment to our country? Thought some years ago we have hot debates on national identity and being heartlanders – the software vs hardware. The 100,000 tombs of our ancestors are worth more than any structural monuments. They are original, authentic and each and every one carries its own history and life story. If our Government lament about the state of apathy or value deficience in our youths, they have to first ask themselves if their actions have contributed to this sorry state of affairs. 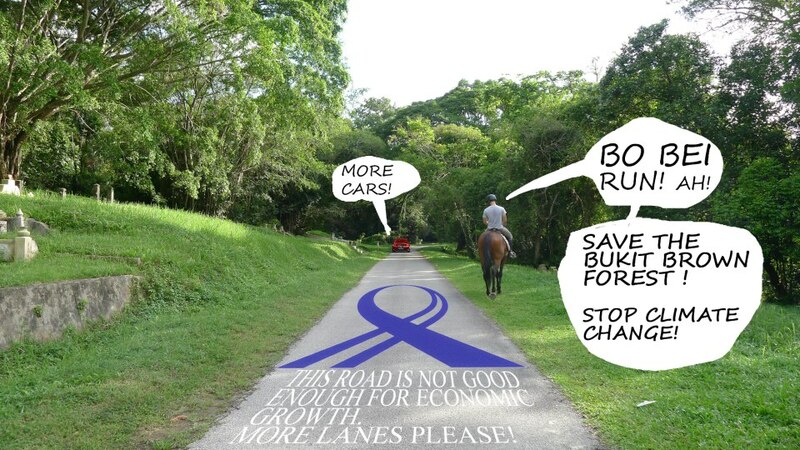 Pingback: Do We Need the Bukit Brown Highway? : a.t.Bukit Brown. Heritage. Habitat. History. how could the government so heartless? how could they just simply destroys those tombs whereby it’s so important for Singapore? other countries take their cemeteries seriously and is open to public including visitors! Singapore has already few historical sites left. the visitors can’t always be stuck to Chinatown, S’pore River, Raffles, and Victoria Memorial Hall! moreover, these tombs are less likely to be seen in the future of singapore so why not just preserve it and allow visitors to take a look? I’ve done a research and there’s a tomb whereby it was carved ’72nd generation of the Confucius family’! the government always has their say without considering the thoughts of the family of these tombs. damn it. It is used everyday by many people, Mr Lee. It is a forest, a carbon sink and habitat of biodiversity. Not about us. Hope you can speak up for Bukit Brown soon. Most of the golf courses, which occupy massive land areas, should be shifted to Johore. Afterall, many of our golfers prefer to play there. These land could then be used for housing for our citizens. It seems to me govt has underestimated the impact to biodiversity and heritage. Of all places, it chooses to build highway to cut through tombs and disturb the natural ecosystems which are the lungs of Singapore. Please join SOS Bukit Brown to get your questions answered. They have the independent researchers from different institutions who are studying the real impacts. The best thing to do now is join in their weekly tour and ask as many questions as you want. If all of us stay at home and close one eye to the issue, one day we may end up with an island without any heritage. I find that the experience is very enriching, and it helps me to understand about the experiences and lives of the many people who were buried in Bukit Brown. All the tombs tell a story. The researchers know these stories and are very friendly to share with you their findings. I know the work is hard. Many people have helped to cut down the overgrown vegetation to label and document each tomb. So many people have been mobilised for this cause. We must thank them. NPC shall support them in their petition against building the highway across Bukit Brown. i hope the work behind the noble men and women who are protecting Bukit Brown will not go in vain. We have listened to your call, and will help to spread the message. Thanks again. Cemetery visit as Singapore Heritage can be added to tourist itinerary for some interested party and students’ excursion for knowing our Singapore Pioneers. Think future generation don’t know how original cemetery looks like compare to the 20 years burial ground in Western part of the island. As long as there is no U-turn on the population boost to 6.9 million, Bukit Brown will be collateral damage in the drive to find homes for the newcomers.